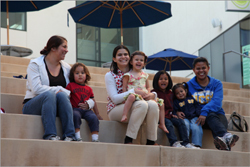 Learn about the Priority Enrollment Program for undergraduate students with children. If you are a student-parent who provides primary care for a minor dependent you may be eligible for priority enrollment. Your status as a parent must be verified through UC San Diego's Financial Aid & Scholarships Office using information from the Free Application for Federal Student Aid (FAFSA). If you have not yet completed the FAFSA, do so as soon as possible at fafsa.ed.gov. Allow several weeks for the Financial Aid & Scholarships Office to receive the information from the central processor. We ask that you explain how priority enrollment status will assist you in your (a) Academic Success (b) Personal and Family Wellbeing. This is done on the priority enrollment request form that will be sent to eligible students in October of each year from the Financial Aid & Scholarships Office. For more information about financial aid and scholarships, visit fas.ucsd.edu or email finaid@ucsd.edu.